Have you ever heard of a Mershon condenser? Me neither, but this Crosley Model AC-7 radio used one (or more). Ohio State University alums are familiar with the name Mershon, if not the man. Ralph Mershon was, among other things, an early manufacturer of electrolytic capacitors. 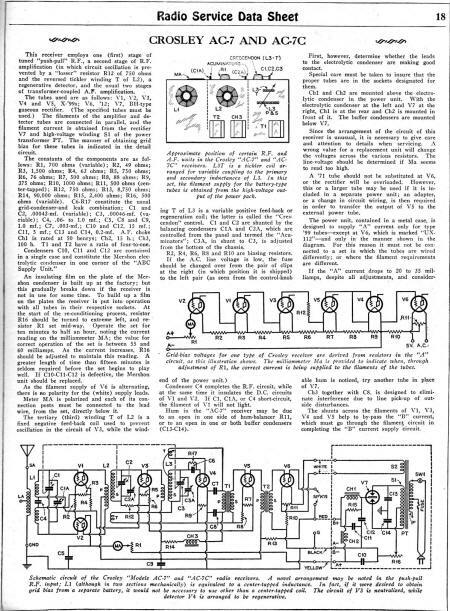 This 1930 service sheet for a Crosley radio mentions the propensity of Mershon capacitors to experience breakdown of the electrolyte when the radio is not used for many months. Rejuvenation is necessary via a prescribed procedure to ensure effective operation in removing the 60 Hz hum in the audio. This receiver employs one (first) stage of tuned "push-pull" R.F., a second stage of R.F. 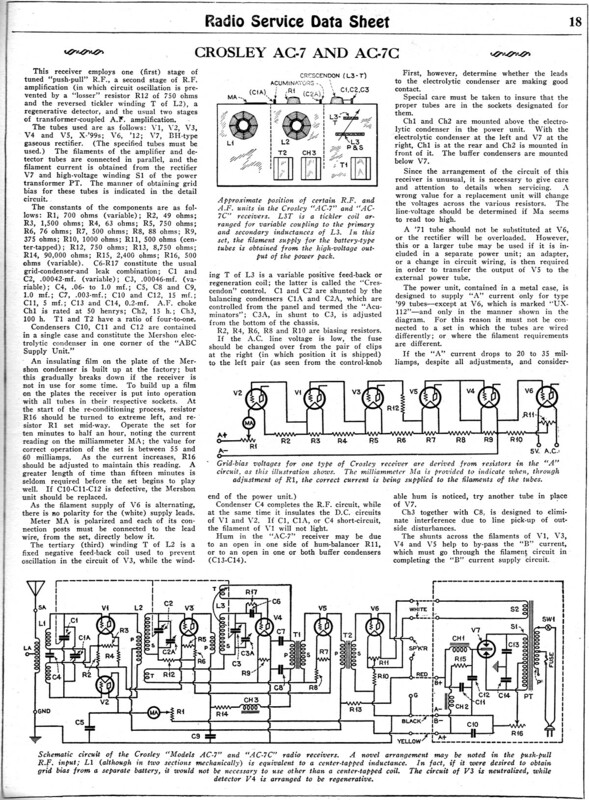 amplification (in which circuit oscillation is pre­vented by a "losser " resistor R12 of 750 ohms and the reversed tickler winding T of L2), a regenerative detector, and the usual two stages of transformer-coupled A.F. amplification. The tubes used are as follows: V1, V2, V3, V4 and V5, X-'99s; V6, '12; V7, BH-type gaseous rectifier. (The specified tubes must be used.) The filaments of the amplifier and detector tubes are connected in parallel, and the filament current is obtained from the rectifier V7 and high-voltage winding S1 of the power transformer PT. The manner of obtaining grid bias for these tubes is indicated in the detail circuit. An insulating film on the plate of the Mershon condenser is built up at the factory; but this gradually breaks down if the receiver is not in use for some time. To build up a film on the plates the receiver is put into operation with all tubes in their respective sockets. At the start of the reconditioning process, resistor R16 should be turned to extreme left, and resistor R1 set mid-way. Operate the set for ten minutes to half an hour, noting the current reading on the milliammeter MA; the value for correct operation of the set is between 55 and 60 milliamps. 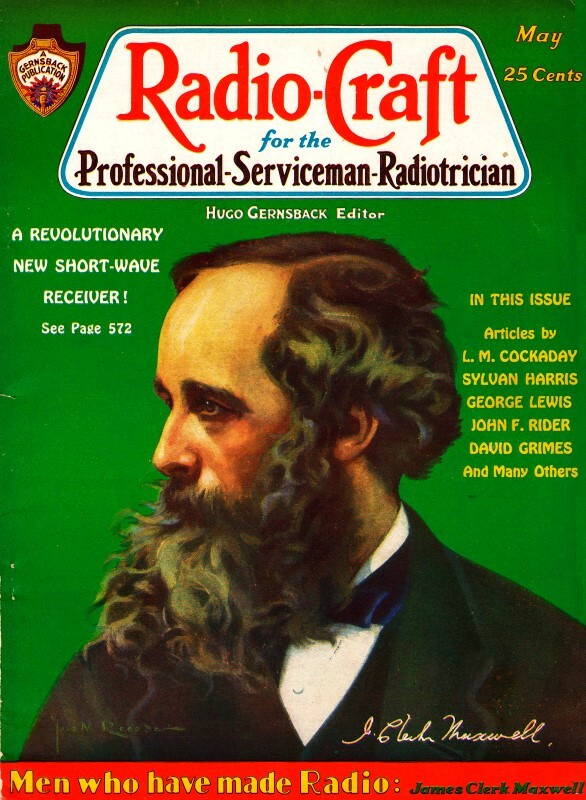 As the current increases, R16 should be adjusted to maintain this reading, A greater length of time than fifteen minutes is seldom required before the set begins to play well. If C10-C11-C12 is defective, the Mershon unit should be replaced.